Last month, Charlotte Simons, a 74-year-old woman from Tigard, Oregon, was wrapping up the mundane task of paying her bills. But when she asked her roommate for his share of the electric bill, she had no idea she would be in for the fight of her life. Charlotte was sitting in her reclining chair when she asked 72-year-old Leo Miller for the money. Without warning, Miller came at her with a plastic bag, covered her face and tried to suffocate her. As Charlotte struggled to breathe, she decided to play dead in the hopes that her attacker would stop. After she went limp, Charlotte was able to push the button on her medical alert necklace and tell the operator to send the police. Once Miller realized that Charlotte was still alive, he began punching her in the face. Until the cavalry arrived, Charlotte had no choice but to fight back. It sounds like Miller was probably in better physical shape than Charlotte since he was successful in overpowering her during the attack. Of course, once Charlotte grabbed Miller in a sensitive area, the attack was derailed long enough for police to arrive and arrest him. He is currently in jail facing attempted murder and assault charges. The fact is people with physical limitations are often the victims of violent crimes because criminals tend to prey on those who are weaker and less likely to fight back. Take a friend. Typically, you are more vulnerable when you leave your home. Whenever possible, I always recommend taking someone with you. For example, go with a friend or family member to the supermarket to do weekly shopping. The old saying that there is strength in numbers is true — you are less likely to be targeted if you are with others. Even if you are with others who are also physically limited, it’s still better than being alone. Stay in communication. Charlotte was able to notify police of the attack in progress by pushing the button on her medical alert necklace. If you have limited mobility, you should ALWAYS have some sort of communication device on you. This could be a medical alert necklace, bracelet or keychain or a cellphone. Either way, make sure to have it on you at all times. There’s no doubt the outcome would have been worse for Charlotte if she wasn’t able to contact the police so quickly. Use verbal commands. If you know anyone who is a police officer, they will probably tell you that one of the most critical skills they learn is to verbalize their actions when dealing with the public. This same logic applies to those with limited capabilities because it will help you sound in-control and commanding. The louder and more forcefully you yell, the more likely your attacker will think twice. If you can’t yell loudly, I recommend carrying some type of whistle or keychain alarm that emits a piercing sound. Drawing attention to your attacker will hopefully cause them to panic about being seen and leave you alone. Strike vulnerable areas. Remember the vulnerable areas on the human body. These include the groin and also the throat. A good strike to the throat will do wonders to get your attacker to leave you alone. A good acronym to keep in mind is ETGS, which is short for “escape to gain safety.” It also stands for “eyes, throat, groin, shins,” which are the key areas to target. Carry a weapon. When it comes to weapons, it is important not only that you are comfortable with them but also that you have the ability to use them. Obviously, my weapon of choice is a gun. If you have trouble racking the slide on a semi-automatic, consider getting a revolver — Smith & Wesson and Ruger make the best revolvers. You could also carry a knife, a stun-gun flashlight or a tactical pen. Preparation is vital to personal protection as you grow older and become less mobile. 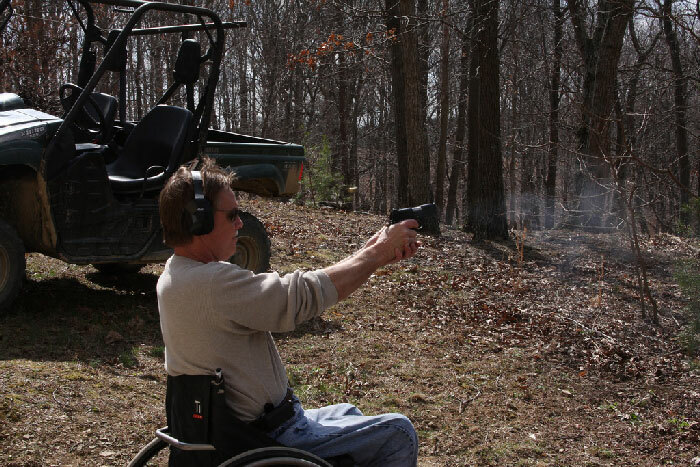 Just because you have limited abilities, you shouldn’t have to live in fear of being targeted. These tips will help you stay safe even when you leave your home and are more vulnerable. When you are honest with yourself and realistic about your capabilities, you can make the proper adjustments and be ready to defend yourself.